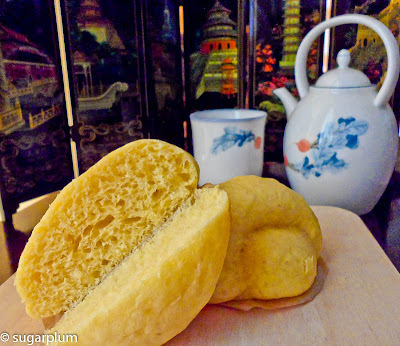 As a kid, I grew up eating these home-made steamed flour buns. 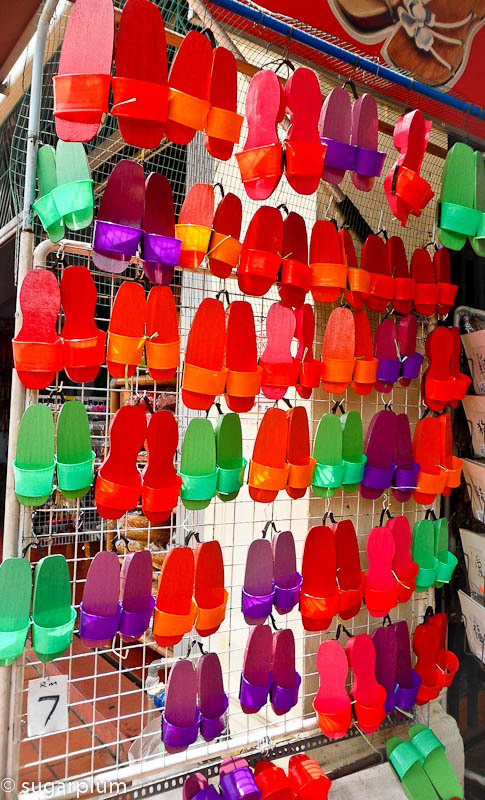 My Tua Eee is a dab hand at making these and they'd be coloured pink and shaped like a traditional chinese pillow. I believe the buns were originally made as altar offerings. We would have these fluffy little pillows steamed up for breakfast and extras would be packed up to be devoured during school recess time. These buns are versatile and can be made plain, flavoured or stuffed with sweet and savoury fillings. To make these more nutritionally acceptable, I've made them with sweet potatoes. 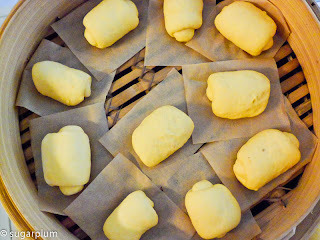 The buns will come out a light yellow colour. 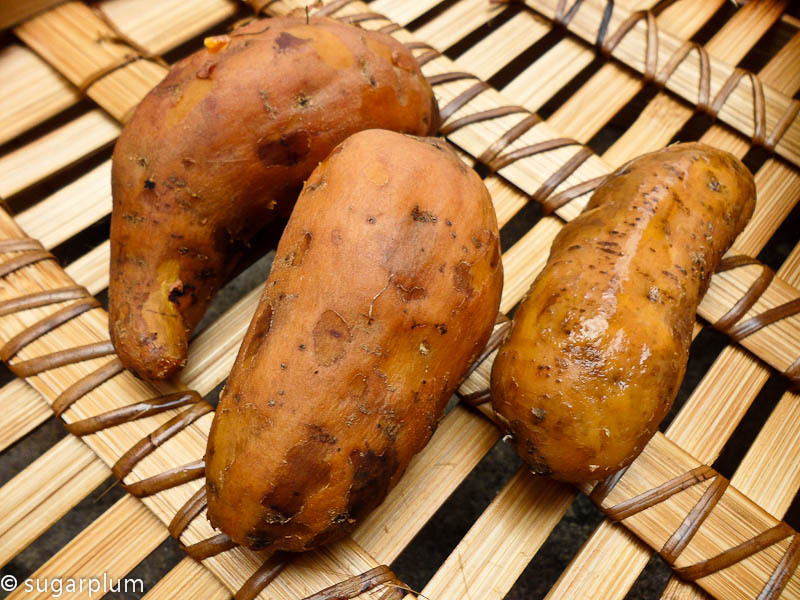 Did you know how nutritious sweet potatoes are? They are high in fiber, beta-carotene, and loads of other goodness (source : foodreference.com). And amongst root vegetables, sweet potatoes have the lowest glycemic index, meaning it digests slower and doesn't spike blood sugar levels. The yeast and double action baking powder makes the buns pillowy soft - it's a very airy cottony-like bun. I've used a breadmaker to do the kneading, but you can hand knead as well - it's just a little messier. The sweet potatoes make the dough a little stickier. To make the shapes, I reverted to the simple swiss-roll shape. While I don't always use estimates, in this instance you may have to adjust the water quantity slightly. I find that 200ml is usually adequate, but sometimes you may need a little bit more to bind. Just add it bit by bit - don't slosh. 1. Steam the sweet potatoes until soft, peel them and then mash with a fork or potato masher. 2. Put the rest of the ingredients together with the sweet potato into the breadmaker and knead about 20 minutes. 3. The dough is ready for proofing when it is smooth and elastic and no longer sticky. 4. Cover and leave to proof in a warm place till double in size, approximately 60 minutes. 5. Punch down the dough, and divide into 50gm portions. 6. Lightly flour the workspace, roll each portion out with a rolling pin and fold into 3rds. Roll it out again and roll it up like a swiss roll. Place on greaseproof paper. To see illustration of this, refer to previous post on Tanzhong Method - Bread. 7. Proof another 45 - 60 minutes or until double the size. 8. Ensure the water is boiling before you place buns into steamer. Steam over high heat for 13 - 15 minutes. 9. Serve hot, preferably with some hot kopi. 10. The buns can be re-heated by steaming again. If you wish, they can be kept frozen and then steamed up again. 1. Pau flour can be substituted with any low-protein flour or all-purpose flour. Do not use bread flour for this. Pau flour makes the buns whiter which is irrelevant when using sweet potatoes. 2. I used orange sweet potatoes, but you can use any coloured ones. To check for doneness, pierce with a fork and if the fork goes through, it is cooked. 3. Double action baking powder reacts twice to help with the rising. Once upon contact with water, and the second time upon contact with heat from the steam. 4. If using a non-bamboo steamer, you may find pock marks on the buns from the water condensation. So gently remove the pot cover when opening to minimise the water droplets falling onto the buns. 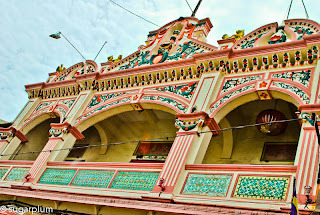 It has been quite a few years since I stepped foot into Melaka - the last being a company team-building trip. 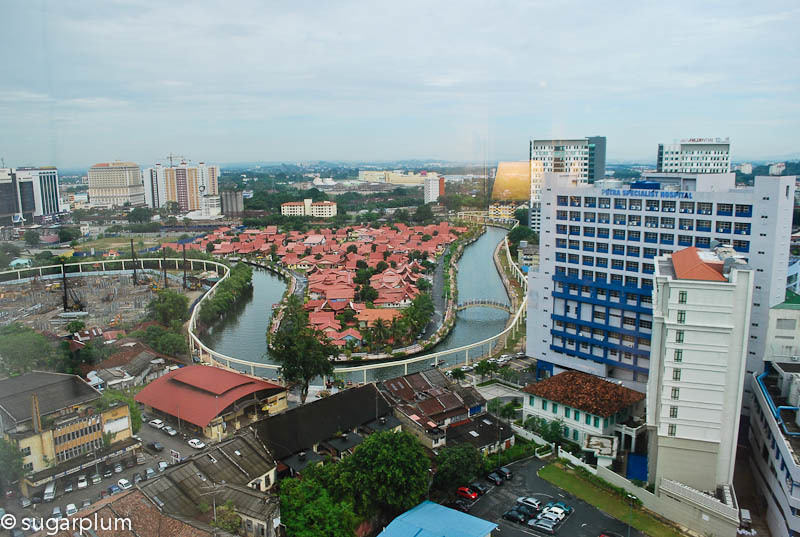 Melaka used to be a school holiday destination when I was younger, but it lost its appeal to concrete, development, traffic and a dirty smelly river. So you can imagine how 'thrilled' I was that my cousin's wedding in Melaka meant that I had to spend a weekend there. 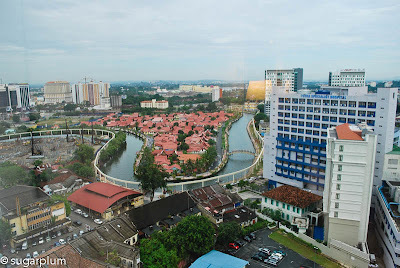 In most countries, riverside land are prime areas; unfortunately in Malaysia it's treated as a rubbish dump. However,the smelly dirty river that I remembered was no longer the same - it's been spruced up, cleaned up and somewhat beautified. Ok, so it's quite touristy and tacky, but at least it's no longer yucks. view from hotel - see the river? Attaining the Unesco World Heritage Site status in 2007 has done a lot for the town - at the very least, the heritage buildings are conserved and restored. 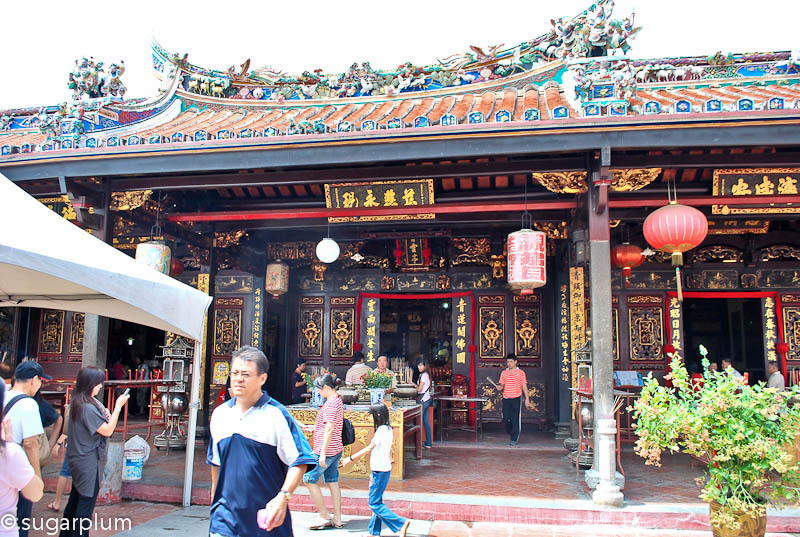 It also preserves Melaka's rich history from the 15th century Malacca Sultanates to the Portugese and Dutch colonisation periods. 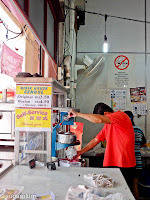 With only a few hours to spare, Big Dog and I decided to wander down the Jonker Street area. 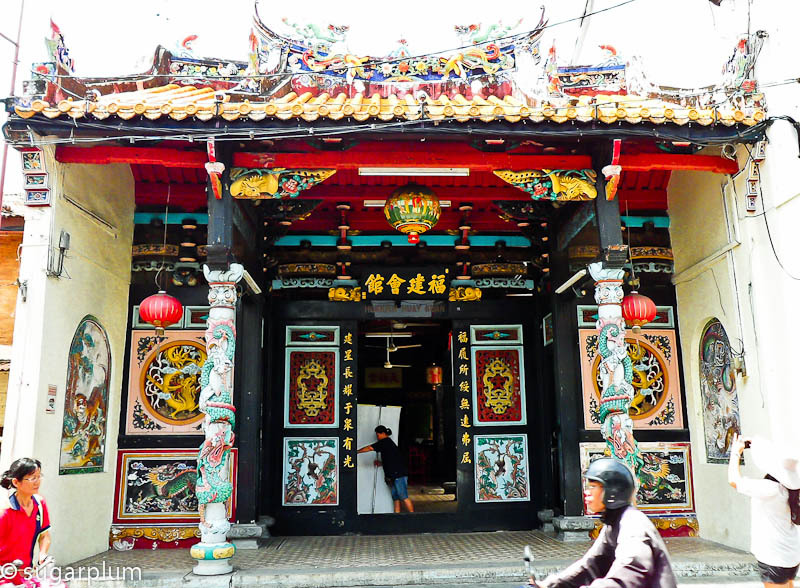 Walking along Jalan Tokong, there is an Indian temple, a mosque and a Chinese temple. 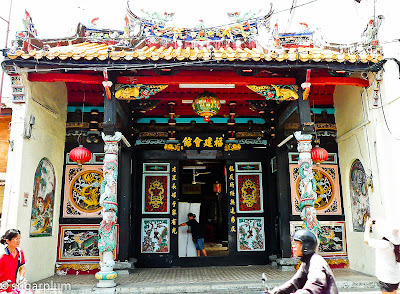 Quite a muhibbah street - mind you the places of worship date back to the 1780s. The Sri Poyyatha Vinayagar Moorthi Temple was built in 1781 and is the oldest Hindu temple in Malaysia. 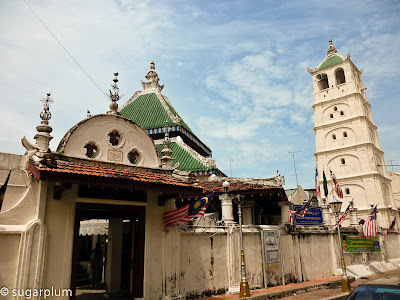 The Kampung Kling Mosque is also one of the oldest mosques in Malaysia and interestingly, doesn't have a Byzantium dome. The Cheng Hoon Teng temple is the oldest functioning temple in Malaysia. 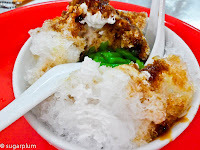 A visit to Melaka isn't complete without taking in some chendol - a shaved ice dessert topped with gula melaka (palm sugar) and the green chendol. Due to the tourist factor and hygiene awareness, it's rare to see the chendol man peddling his wares from the roadside bicycle anymore. 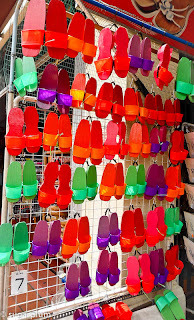 We found ours in a shop called Bibik House. 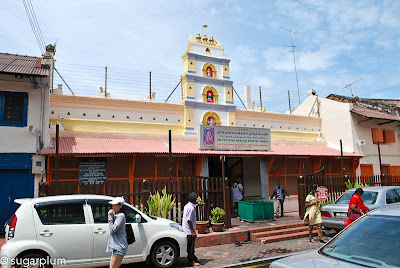 While it's almost impossible to get lost in Melaka, it did take us a couple of rounds to find the Portugese Settlement ( the one-way roads threw us off). 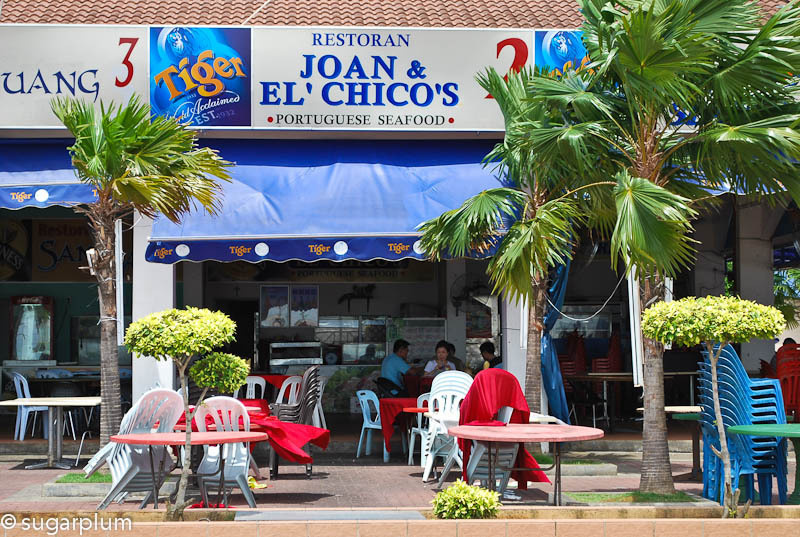 We wanted some Portugese seafood. Lunch there was a 50/50 affair as only 2 stalls were opened for business. 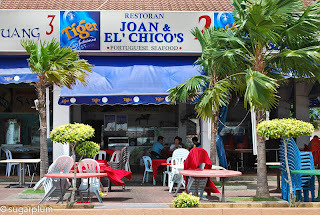 We picked Joan & El Chico's because it looked cooler. Hmm, maybe lunch isn't popular as it's murderously hot during mid-day? Lucky for us, our 50% turned out to be a winner. 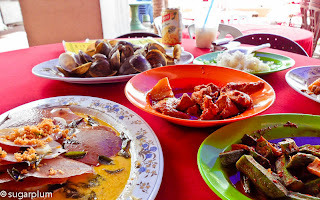 Woohoo...lunch was chicken dable (devil's chicken), ladies' fingers fried with sambal, mussels in ginger and chilli padi and garlic butter scallops. Er, we were famished. 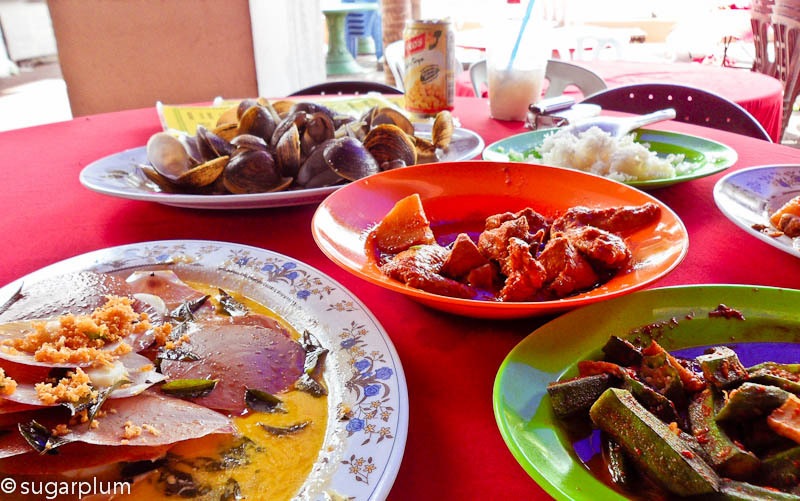 We came, we ate and we left a pile of shells. Total damage? RM63, which included 3 drinks (er, we were thirsty too). Value for money! We are going back to Melaka. I love chorizo, the spicy spanish sausages. It's such a treat to have them and it's darn well difficult to find any good ones here. And even if you do, you end up paying a small fortune for these imported deli products. Having heard me lament time and again about my deprivation, my lovely sister-in-law took pity on me and brought some from Borough Market in London. Down to my last link (wink, hint) I decided to make some risotto with them. Risotto and me, it wasn't love at first sight. I guess because my first risotto tasted like watery porridge and was very carby and heavy. However having eaten better risotto since then, I have a better appreciation for this dish. 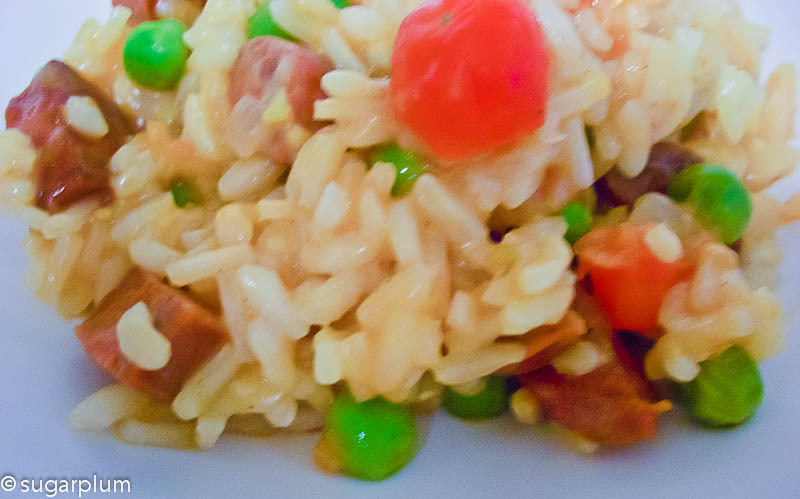 Risotto is a very versatile dish, and you can have it vegetarian, or pescetarian or not. You can make it as decadent or as simple as you like - from champagne & truffles to simply mushrooms. It's rather like the Chinese all-in-one-pot rice - anything goes! Asian rice isn't suitable for risotto - you end up with porridge. 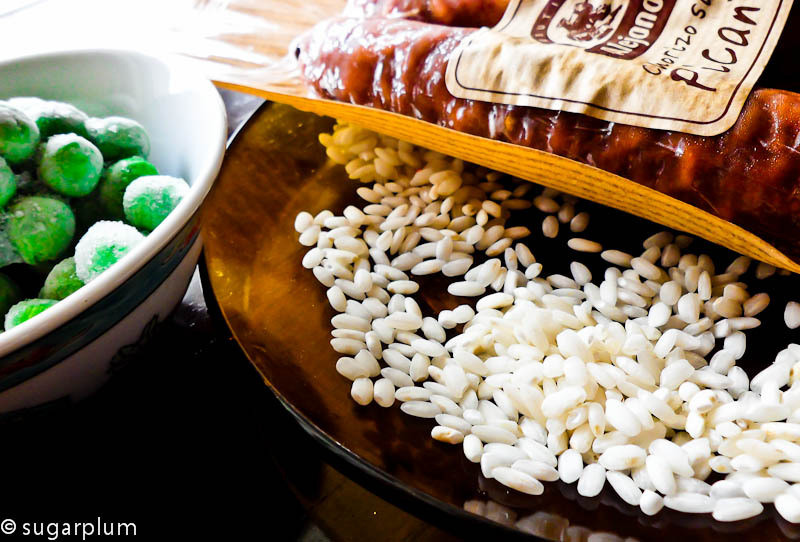 Use arborio rice, a short-grain rice which contains a lot of starch. It is this starch that gives the risotto its creamy texture. This dish takes some patience as you have to stir to massage the starch out of the rice. The key to making creamy risotto is to rest it for a couple of minutes at the end, covered with a lid. This allows the risotto and the starch to settle into a creamier velvety texture. Cooking time is approximately 25 - 30 minutes for this. The rice should be tender with a slight chewiness to it. It should still look very wet at this stage, but once you rest it a bit the starch will settle (unfortunately the photo I took doesn't show this very well). And don't worry about having to stir continuously for 25 minutes - your arm will drop off! Just give it a couple of stirs everytime you add stock to the rice. As a general rule, you will need 3 cups of liquid to 1 cup of rice. And the liquid has to be hot, otherwise the rice won't cook. If you like more complex flavours, susbstitute about 150ml of stock for red wine. 1. Heat the olive oil and butter in a large saucepan over medium heat. When the butter has melted, add the onions and fry gently for about 8 - 10 minutes until the onions are softened but not browned. 2. Add rice and stir for 2- 3 minutes. This seals the rice and ensures it remains chewy. 3. Add a ladlefull of stock to the rice and bring to simmer gently. Stir regularly until stock has been absorbed. Continue to add stock one ladle at a time and stir. Repeat. About 10 minutes into the process, add in the diced tomatoes. Repeat the stock/stir process until all the stock has been used up, the rice is tender, and the risotto is creamy. This should take approximately a total of 25 minutes. 4. Stir in the peas. 5. Stir in the cheese, reserve a little for serving. Season to taste with salt and freshly ground black pepper. Cover the pan with a lid, and rest the risotto. 6. Heat another frying pan over medium to high heat. Add the choriso and fry for 1 -2 minutes until the oil has been released. Remove from pan and drain on kitchen paper. Reserve the oil released by the chorizo for serving. 7. Stir the cooked chorizo and peas into the risotto and garnish with the chopped parsley, remaining grated cheese and drizzle the reserved oil over. 8. Serve with a lightly dressed green salad. ﻿ Before you get on the high horse accusing me of animal cruelty, blah blah, horse nuts is the direct translation for kacang kuda, or more commonly known as chickpeas. 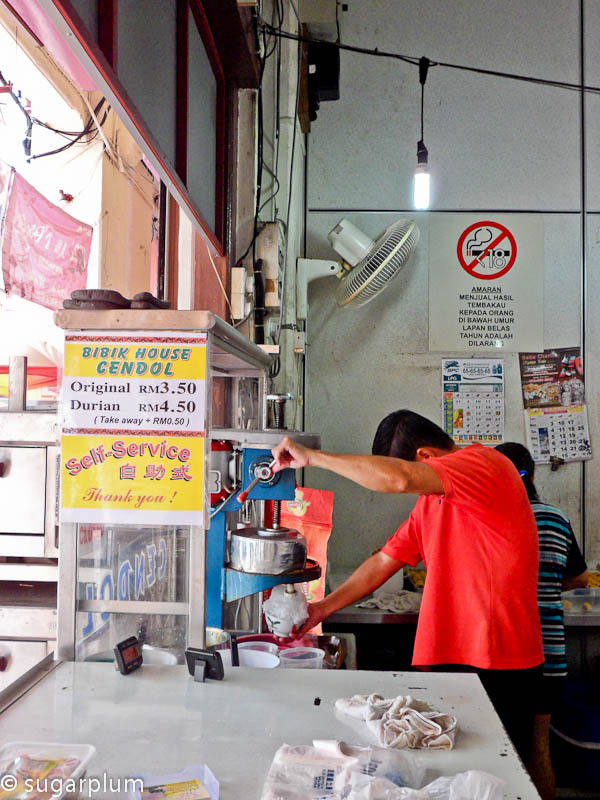 I still remember the days when you get the kacang putih man peddling his wares from the motorcycle. You'd get chickpeas still steaming hot served in a paper cone. Come to think about it, the paper used was recycled paper, and while it wasn't the most terribly hygienic thing to use, we were already recycling back then! 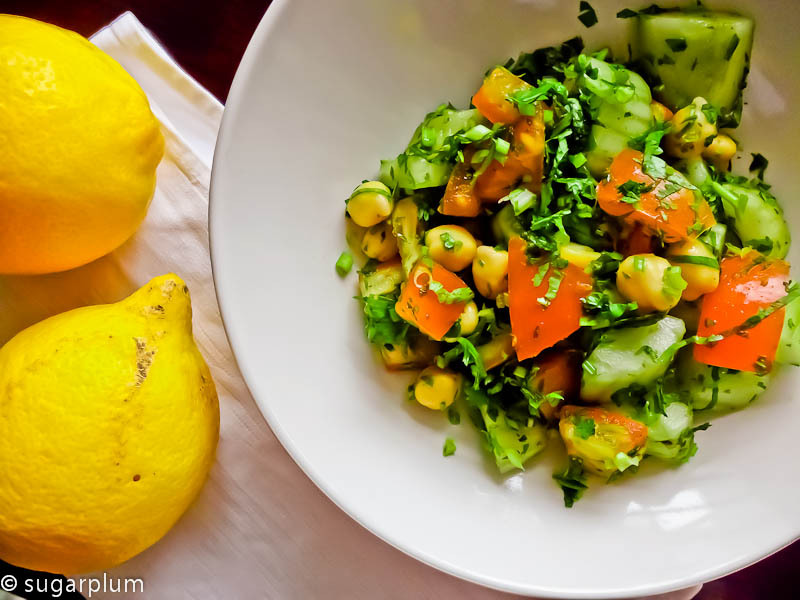 For the chickpea salad, I was inspired by tabbouleh, the middle-eastern salad with cracked wheat tossed with plenty of parsley and mint. But cracked wheat is a rather alien product to the relatives, so I thought why not substitute it with chickpeas and coriander. Both ingredients being familiar, though not usually put together into a salad. It's high in fiber, and has a zing to it due to the coriander, mint and lemon flavours. This is an easy salad to put up; dress it as close to serving as possible so that the acidity from the lemon doesn't extract moisture out early and you end up with a very wet salad. Adjust the quantities to suit, but use roughly equal amounts of diced cucumbers, tomatoes and chickpeas. Best served chilled. For the chickpeas, I bought the dried variety. You'll have to soak it overnight in a pot of water. 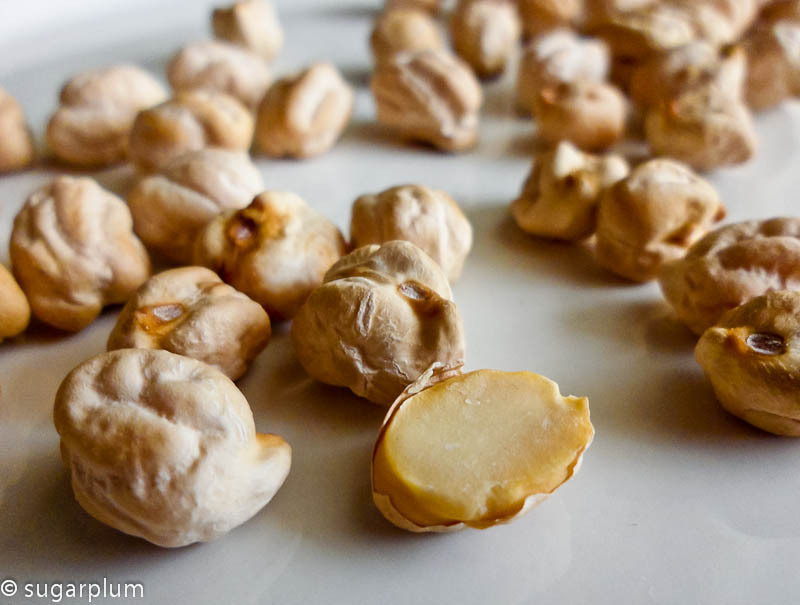 The chickpeas will rehydrate and bloat up. Drain the soaking liquid, put fresh water into the pot, add a teaspoon of salt and boil till tender. You can also use canned chickpeas if that's available. Method:1. Toss the vegetables and chickpeas together. Chill. 2. Just before serving, toss in the lemon juice, splash olive oil to lubricate and sprinkle with salt to taste. Mix gently and well.